Whether by water, rail, road or air, this section gives you an insight into the wide-ranging spectrum of advanced, high-quality services provided by the various carriers in the transport world. The choice of carrier for the transport of your merchandise depends on the transport distance and the location of the companies involved. For longer distances, it is worth looking into the possibility of combined transport, where goods are transported by several carriers. 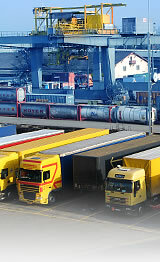 Consult the rubrics Air Transport, Rail Transport, Shipping or Road Transport to find your new logistics partner who will cut time and costs in transporting your freight from A to B throughout Switzerland, Europe and the world.